A pedestrian about to leave his mark on an environmental awareness campaign in Shanghai. Photo via This Is Colossal. 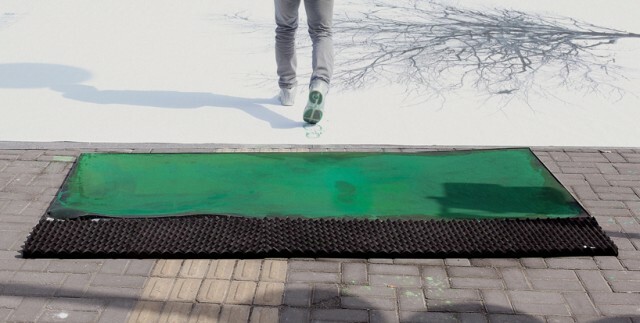 A simple crosswalk in Shanghai was turned into a piece of eco-conscious artwork, raising awareness about the environmental benefits of walking. In a partnership with advertising firm DDB China and the China Environmental Protection Foundation, 132 white canvases, adorned with painted images of leafless tree branches, were laid across pedestrian crossings and turned into street art. Right before pedestrians crossed over the intersection, spongey green pads coated the bottom of their shoes with paint, allowing them to add footprint-shaped “foliage” to the bare tree branches. An estimated 3.92 million people “greened” these pedestrian crossings. China is swiftly motorizing, with an estimated 78 million cars, but it can avoid the fate of auto-oriented industrialized countries by keeping shoes on the ground and off the pedal. The millions of little painted leaves adorning these elegant banners may not photosynthesize the carbon dioxide out of China’s air, but they can highlight the need for reducing China’s carbon footprint, one green painted footprint at a time.